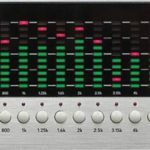 TC Electronic Reverb 4000 is a single-engine stereo version of Reverb 6000, featuring the best reverbs and presets from Reverb 6000 and M5000 as well as emulations of numerous immortal classics. TC Electronic Reverb 4000 is the first stereo Reverb capable of rendering credible space onto two discrete sources, or to truly process a composite stereo source. Quite simply, TC Electronic Reverb 4000 gives you the most immense and innovative selection of State-of-the-Art stereo Reverbs – at the touch of a button. Designed as a single rack space module with an extremely easy-to-use, instant-access interface, and with the option of using the ICON software editor for PC and Mac in DAW environments, TC Electronic Reverb 4000 is the ultimate choice for live and studio applications working in stereo. TC Electronic Reverb 4000 complements any large scale mixing console, and provides the professional studio with the ultimate Main Reverb featuring an amazing palette of simulated rooms from natural sounding credible spaces to emulations of vintage reverbs and TC Classics. TC Electronic Reverb 4000 integrates perfectly with DAWs and features 24 bit AD/DA converters as well as 44.1 to 96kHz Sample Rates. Connect to the included ICON software editor via USB for easy access, complete overview and detailed editing. TC Electronic Reverb 4000 comes fully loaded with seven pristine reverb algorithms, covering both generic and source reverb types. With these algorithms at hand, you can rest assured that you will be able to find – or tailor – the perfect reverb no matter what type of production you’re working on. NonLin2 – NonLin2 is an Effect Reverb with controllable Envelope, Attack, Hold and Release, encouraging you to experiment and be creative going from subtle or extreme. VSS4 – Stereo Reverb that radically departs from blurry sustain concepts of the past. Based on source related reflections from multiple angles, the precision of VSS4 is comparable to real-world mono or stereo sources positioned in an authentic space. VSS3 – A true-to-life sound to mimic environments. We’ve designed this algorithm to establish incredibly convincing room types with a “true-to-life” sound. VSS4 TS – For film work, multiple mono reverbs may often be more useful than pre-configured structures for stereo or 5.1. VSS4 TS gives you 2 completely independent mono reverbs. Ambiator – Small space modeler with integrated panning of a source. Try it when you grow tired of power panning or just need to add that subtle sense of ambience bringing life and character to certain elements of a mix. DVR2 – Generic Reverb with a true vintage flavor and a flattering sustain effect. It complements Source Reverb very well, and both can be great for different types of reverb applications. Reverb-4 – Generic Reverb. Suited for composite material and main microphone processing. It adds spaciousness rather than localization to your audio image. Our innovative and attractive TC Icon Remote is able to control a wide range of our units – including Reverb 4000.